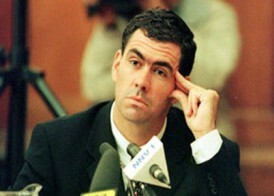 Hansie Cronje was “born again” during the 1992/93 cricket season. He had been driving along one of the South African “National Routes”, the N2, when a little girl ran out in front of him. He did his best to avoid the inevitable, but could not prevent the collision that took the child’s life. He was distraught, and understandably so, thus his turning back towards his faith is hardly surprising. Cronje was already a Test cricketer at this point, and before long he was to become captain of South Africa, despite being just 24, and younger than all his teammates. His predecessor was Kepler Wessels, and Cronje’s first taste of captaincy came at Sydney in January 1994. Shane Warne worked his magic to dismiss South Africa cheaply twice and Australia needed just 117 in the fourth innings and, with Wessels having to leave the field injured, no one gave the visitors a chance. That they eventually won by just five runs was due to Cronje’s skillful and innovative bowling changes and field placings, characteristics that have not always been looked at in the same light since he left the game. There was no miracle in the next Test, in which Cronje led the side again, but it was still no surprise when, on Wessels’ retirement from the captaincy a few months later, Cronje was the next incumbent. He went on to become one of the most respected captains that the game had seen, seemingly beyond any possible reproach, and had it not been for a stroke of ill-fortune he might have stayed that way, and Shaun Pollock might never have captained his country and, in the fullness of time, there would have been a seamless transition from Cronje to Graeme Smith. South Africa toured India in the early weeks of the new millenium, and in mid-March the South Africans stayed at the Taj Palace Hotel in Delhi. The Indian police were eavesdropping on and recording telephone conversations in connection with an investigation into an extortion racket, wholly unrelated to the game of cricket. When they heard a conversation between a man with an Indian accent and one who sounded Afrikaans, they carried on listening, and taping what was clearly a discussion about rigging a cricket match, with a substantial sum of money to change hands. It seemed that, in addition to those having the conversation, Herschelle Gibbs, Henry Williams and Pieter Strydom were also involved. A transcript of the recordings was released on 7 April 2000. It was a stroke of luck for Cronje that by then he was back in South Africa and free from the prospect of immediate arrest by the Indian police. His initial reaction was I am stunned, the allegations are completely without substance. Dr Ali Bacher, the Managing Director of the United Cricket Board of South Africa also sprung to his captain’s defence, describing Cronje as having unquestionable integrity and honesty, and stating unequivocally that no South African cricketer has ever been involved in match-fixing. In fact the whole nation shared the same indignation. RUBBISH screamed the headlines, and men like Bob Woolmer expressed similar views to Bacher. Much was made of the opinion of Trevor Chesterfield, a senior South African journalist who heard the tape and declared it was clearly a forgery. Cronje must have briefly been delighted, but also surprised to hear that. Unfortunately for him there was a simple explanation. The reality was that the Indian Police had not released the tape, just a transcript, and what Chesterfield heard was a couple of actors reading aloud from that document. Bacher the indignant called a press conference in Durban for 9 April. Cronje’s voice came out with all the right soundbites, but there was a lack of emotion, and he seldom looked his questioners in the eye notwithstanding almost all were on his side. In short his body language was not consistent with the words that he spoke. On the following day, Monday 10 April, the row had got to the stage where there were talks between the South African Deputy Minister of Foreign Affairs, and the Indian High Commissioner in Pretoria. Given that countries have gone to war over less, Cronje’s mind must have been in a state of considerable turmoil. It is well publicised that at about 3.00am on 11 April there was a tearful and apologetic call from Cronje to Bacher explaining that he had not been truthful and admitting that the transcribed conversation was indeed what it seemed. What is not so well known, but is set out in Garth King’s 2005 biography of Cronje, is that at around 8.00pm the previous evening, from someone else’s mobile phone, he had telephoned his wife asking her to dispose of a bag containing a substantial sum in US Dollars. Just before he rang Bacher he rang her again, tearfully told her “the truth”, and instead of his previous request asked her to take the money to his lawyer. His partial admission made to Bacher, which immediately resulted in his being stripped of the captaincy, Cronje seemed to go into overdrive and sought audiences with both the Deputy Minister of Foreign Affairs and the Minister for Sport. According to his biographer this seems to have been largely against his lawyer’s advice, and without waiting for much input from Bacher. What was he thinking? Was his volte face a genuine desire to purge his sins, or did his motivation lie elsewhere? It was just two days after the confession that the Minister for Sport made the decision to hold the judicial Commission of Inquiry that was convened under Judge Edwin King, which began on 7 June, less than two months later. In the lead up to the Commission Cronje’s popularity with the South African public was, despite his admitted involvement, much the same as before. In a poll conducted by The Star newspaper 94% of respondents felt he should be allowed to play on, and an Afrikaans Sunday newspaper, Rapport reported only a handful of negative comments amongst thousands of messages of support that had been received. Of course at this stage Cronje had admitted to receiving only about USD15,000, and had been adamant that he had never fixed a match nor discussed that possibility with any teammate. The forty men summoned to appear before the Commission, which Judge King always stressed was a fact-finding mission, rather than a court of law, included all who had been involved in South African international cricket, whether players or officials. The same offer was made to all, immunity from prosecution in South Africa, but only on the basis that all testimony was full and honest. It was of course expected that Cronje would reveal all about the subject of the telephone conversation, an ODI played in Kanpur on 19 March 2000. It was the fifth and final match in a dead rubber, India already being 3-1 up. The requested “fix” was that South Africa would score less than 270, Gibbs would be dismissed before he scored 20, and Williams would concede more than 50 runs in his ten overs. Strydom was approached by Cronje, but wasn’t interested, and Nicky Boje, whose name came up in the transcript, was not even asked. Gibbs agreed to accept USD15,000, essentially because he idolised Cronje, and Williams followed on because Gibbs did. Having told his contact, “Sanjay”, that these two and the, in truth not involved Strydom, would cost him USD25,000 each, Cronje asked for a total of USD140,000. If the fix had worked Cronje would have pocketed USD110,000. In the event no money changed hands. Gibbs scored 74, South Africa 320, and Williams pulled up lame after 11 deliveries, at that point having taken one wicket and conceded 11 runs (six of them wides). In fact the fix was so far away from coming off that it seems to me, had he chosen to try and brazen things out, Cronje might well have shrugged that one off. Prior to hearing from Cronje Judge King heard from other players and a number of incidents came to light. Cronje confirmed them in his evidence. The first was back in 1995 when around USD10,000 was offered to the team to throw an ODI against Pakistan. Cronje discussed it with Pat Symcox but the offer was rebuffed. The source of this proposal was a man called “John”, who Cronje believed to be the same man who had, shortly before that, approached Shane Warne and Mark Waugh, . Cronje also confirmed that he had discussed with Strydom an offer he had received in respect of the first of the two Test matches in India in 2000, and that he had mentioned a similar proposal in respect of the second to Lance Klusener, Jacques Kallis and Mark Boucher. They weren’t interested. The discussion lasted a matter of seconds. When Cronje gave his evidence he introduced new material as well. He talked about a man called “Sunil”, who was someone he had met on his two tours of India, but whose suggestions about possible match-fixing he had declined. Different considerations applied with MK Gupta, who he had been introduced to via Mohammad Azharuddin. Gupta offered Cronje USD30,000 to ensure South Africa lost the Kanpur Test in December 1996. Cronje did absolutely nothing, his side were already in a hopeless position and duly lost by 280 runs, but he trousered the cash. He explained that subsequent to that series he had also received two further payments from Gupta, totalling USD80,000, in return for “information”. And then there was the Centurion Test against England in January 2000, just before the trip to India. The apparently rain-ruined match was heading towards an inevitable draw when Cronje offered terms to England skipper Nasser Hussain and a match was conjured up out of nothing. England won but the identity of the victors was irrelevant to Cronje’s purpose his 50,000 Rand and leather jacket simply requiring a definite result. In terms of opportunities Cronje did not take he told the Commission that MK Gupta offered USD300,000 to ensure South Africa lost the third Test against India at the New Wanderers in January 1997. The home side had an unassailable 2-0 lead, but Cronje refused. Rather better known was an offer, eventually USD250,000, to lose an ODI in Mumbai in December 1996 by between 70 and 90 runs. It was a game played for Mohinder Amarnath’s benefit and was hastily upgraded to an ODI in order to attract more interest. The match was duly lost by an understrength South Africa but the offer, which Cronje had discussed with not only his teammates but then coach Bob Woolmer as well, had been rejected. Some of the players were interested, but most were not, and Cronje was not prepared to do the deal in the absence of unanimity – Woolmer told him in no uncertain terms not to even consider it, and later told the Commission he wasn’t in fact sure that the poker-faced Cronje was not simply immersing himself in an elaborate practical joke. The King Commission’s final report was released just over a year later. It never did conclude satisfactorily, Cronje’s lawyers having tried to have its constitutional validity brought into question. There was real speculation at the time that Judge King would conclude that Cronje had been less than candid with him and that as a consequence he should lose his immunity from prosecution. In the end it seems that what Judge King may well have done was bring the Commission to a rapid end in order to avoid litigation about its status, given a recent precedent that had afforded some support to Cronje’s lawyers’ legal argument. As to whether Cronje had been honest with him Judge King ducked that one; The Commission was required to express to the National Director (of public prosecutions) an opinion as to Cronje’s credibility……. the Commissioner is not in a position to express such opinion and has advised the National Director accordingly. Moving slightly back in time the UCBSA had banned Cronje for life in October 2000 from all cricketing activities. This meant he could not coach at any level with any organisation, club or team that was affiliated to the Board. It was later recognised that he could coach privately, and work in the media. Cronje was still not satisfied and, perhaps buoyed by what he saw as a success against the Commission, launched a legal challenge to the ban before the Pretoria High Court. There was the odd pyhrric victory in the judgment of the Court but, essentially, his defeat, together with an order that he pay half of UCBSA’s costs of the action, was confirmed in October 2001. Why did Cronje take the bookmaker’s shilling? That has to be the easiest question to answer. He may not have earned as much money as fellow cricketer Sachin Tendulkar, nor fellow South African sportsman, golfer Ernie Els, but Hansie Cronje’s central contract and his various commercial endorsements gave him a very healthy income indeed. It can only have been greed that drove him to the dark side. What continues to surprise me is the brazened approach that he took – did he really think that something like that discussion with all his teammates about throwing that New Wanderers game in 1997 would not forever taint him in the eyes of some of them, if not all? The arrogance is breathtaking – with individuals his approach seems to have been to raise the issue in a manner which suggested that he might just be joking, thereby enabling him to judge from their reaction whether to press on – but did he really think that team approach would remain a secret? The answer to that was presumably “yes”, Cronje must have regarded himself as untouchable. Like many criminals Cronje doubtless thought he would never get caught, and when the storm broke on 7 April his initial reaction would have been that there was not going to be a decent case against him. He had every reason to believe that Gibbs and Williams would support him, and he knew Strydom and Boje telling the truth could not hurt him. But then I think he realised that there was no way all his teammates were going to keep quiet about everything, and that it just needed one of “John”, “Sunil”, “Sanjay” or MK Gupta to decide to do a deal with the Delhi Police and he would be in real trouble – certainly his disposal of the mobile phones he used to communicate with them occurred very early in the piece. Cronje must have quickly realised that this could get very big indeed. With good reason he would have feared the Indian criminal justice system. India did not have an extradition treaty with South Africa, but that in itself was no guarantee that a country less than a decade into its re-acceptance by the world would not be prepared to hand him over, particularly when he realised the diplomatic storm that was brewing as result of the knee jerk reactions that were uttered in his support when the story broke. It is my belief that the volte face I referred to earlier was in fact a cynical and entirely predictable attempt at damage limitation. There was a very rapid risk assessment done and Cronje realised that as far as his teammates were concerned he had to assume that they would all tell the truth. The Centurion episode was slightly different as no other players were involved, and on this occasion the bookmaker involved was a South African, but I still think this was a calculated decision on Cronje’s part. Once his admissions were in the public domain attention was bound to centre on that game, and he would have reasoned that it would be much better to go down for taking money for making a game of it, than for contriving a South African defeat. It may even be that in his own warped reality he still thought that in making a game of the match he had done the right thing for cricket. There were others in a hole as well not least the ICC. Similar allegations against leading Pakistani players had been rife for years, and a Commission of Inquiry under Justice Qayyum had been established as long ago as August 1998 but had not yet reported (although it was to do so in September 2000). The game’s governing body realised that swift action was needed, and the South African government reacted instantly. They too were, as already noted, in a difficult position given the short period of time that had elapsed since the reborn nation had been allowed back into world sport. The key for Cronje must have been the immunity from prosecution. With that he would be free of the spectre of extradition, so he decided to appear to confess all. Some believed and doubtless still believe that he did, but I am far from convinced. The reason for Judge King’s less than wholehearted support for his immunity was the discovery of foreign bank accounts that Cronje did not disclose. The suggestion that amongst those few admitted crimes there were not a shed load of other examples of spot-fixing known only to Cronje and his paymasters is one I struggle with. Was he an occasionally daring and inspirational captain, or was there a different reason for the sometimes eccentric looking changes in bowling and batting orders, field placements and other unconventional tactical nuances? My belief that Cronje’s every action was a carefully orchestrated one is underpinned by looking at his actions in, when he thought the Commission was going against him, trying to attack its legality. A large area of his concerns seem to have surrounded the question of what might been uncovered when the Commission sent investigators to India. The legal challenge to the life ban so soon after its imposition is also not the action of a man who is any way contrite or repentant about his actions. In my view it is the action of a man who has high in his mind the old maxims confess and avoid and attack is the best form of defence. Having failed in his court action Cronje went back to his studies in order to obtain a masters degree and at the time of his death had been appointed Financial Manager of Bell Equipment, a company that manufactures earth-moving machinery. With his chequered history it raises my eyebrows that he was given what sounds like a position of some trust, but then again I suspect that in truth he would have been just a figurehead, taken on in the main to boost his employer’s profile, something I have no doubt he would have achieved with some aplomb. But it was not to be. Less than four months after joining Bell Cronje was dead. His scheduled flight having been cancelled as a result of a hailstorm he accepted an offer to fly with a couple of pilots who were taking a Hawker Siddeley 748 Turboprop to where he wanted to go. The adverse weather conditions and technical problems caused the pilot to miss his first pass on approaching the runway at George, and before he could try again he managed to crash the plane in the Outeniqua mountains. All three men died. The technology that the plane came from was developed in the 1950s, so given that the weather was such as to keep markedly more sophisticated aircraft in their hangers, the trip really was a gamble on Cronje’s part – perhaps not quite the equivalent of asking Jonty Rhodes to bowl the first over of a Test match, but certainly the equivalent of his taking the new ball himself. There were of course muttered conspiracy theories involving disgruntled bookmakers’ represenatives armed with hand tools utilised in a manner designed to cause the plane to fall out of the sky, but I don’t ever recall one being taken seriously. The subsequent inquest heard that two wires on the plane’s compass had been disconnected, fuel for such a theory if there was any, but there were so many problems on both the plane and the ground that nobody bothered to back that particular horse. It is the court’s view that the death of the deceased Wessel Johannes (Hansie) Cronje was brought about by an act or omission prima facie amounting to an offence on the part of pilots. was the Judge’s conclusion. So Cronje’s last gamble failed and he never did have the chance to make amends for the grievous wrongs that he did to the game of cricket. Whatever his many faults were there can be little doubt that there was a decent man underneath – there are far too many people who have written positively of him, and not just before the storm broke, for it to be otherwise- I for one am prepared to believe that had he lived he would, by now have redeemed himself – probably.. The story of Hansie Cronje’s fall from grace is a remarkable one, and a salutary lesson for all who play sport at a level that attracts the interest of gamblers. Not least amongst its notable features is that will not lie down and go away. As recently as just a few weeks ago the Delhi Police finally got round to laying charges against a number of bookmakers and Cronje himself. In a legal system that clearly does not take on board the concept of abuse of process in a way that I have worked with throughout my career, the court have taken a step that reeks of good sense and pragmatism, and ordered that the charges against Cronje should be dropped. But when, doubtless in a few more years time, the case finally comes on for trial, maybe we will learn a little more about the dark side of the former South African captain, and if so perhaps the way that he is remembered will change. An absolutely superb article here from Martin – well worth the read and lots of the features team learnt some new facts about the Cronje saga.